The HDP5600 is conveniently available in either 300 dpi or 600 dpi to meet your unique card printing needs. WHAT ARE THE FARGO HDP5600 ID CARD PRINTER�S KEY SPECIFICATIONS? The Fargo HDP5600 ID Card Printer fullfills the needs of enterprise that need to issue high-resolution and secure badges in a cost-effective way in high volumes. It offers increased capacity and the best print quality. The HDP5600 is backed by the best warranty in the industry. The fully comprehensive three-year package includes no-quibble printhead lifetime warranty and a loaner service. 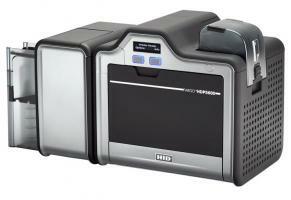 CAN I STORE DATA ON MY CARDS WITH A FARGO HDP5600 ID CARD PRINTER? 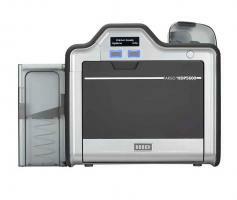 Several options are available to convert your Fargo HDP5600 ID Card Printer into a powerful encoding machine. If you need to print and encode cards with a magnetic stripe, choose a Fargo HDP5600 ID Card Printer with a magnetic encoder. Widely used in access control and time and attendance, magnetic cards are an affordable choice for your badges. If you need more secure badges, opt for a Fargo HDP5600 ID Card Printer with smart card encoder. With contact and contactless smart cards, the data is securely encoded into an embedded chip. To store data and to be read, a contact smart card must be inserted into a reader, while contactless smart cards only need to be waved within range of a reader. Perfect for student IDs, healthcare cards, loyalty cards or government IDs, smart cards can now easily be created with a Fargo HDP5600 ID Card Printer with smart-card encoder. WHICH TYPES OF LAMINATES DOES THE FARGO HDP5600 ID CARD PRINTER OFFER? The Fargo HDP5600 ID Card Printer is available with a single or dual-sided lamination module to add an extra layer of protection to your printed cards. WHICH OPTIONS CAN I ADD TO UPGRADE MY FARGO HDP5600 ID CARD PRINTER? Single or dual-sided card lamination modules: apply overlaminates to your cards to increase card durability and reduce the risk of counterfeiting and tampering. 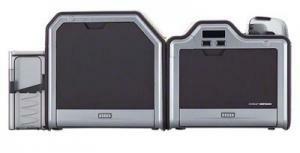 The Fargo HDP5600 ID Card Printer can laminate both sides of your cards simultaneously for maximum efficiency.